It has often been said that the kitchen is the heart of a home. It’s where family and friends gather and visit around the table. It’s where many meals are shared, and is generally just a place in the home that deserves some special attention. 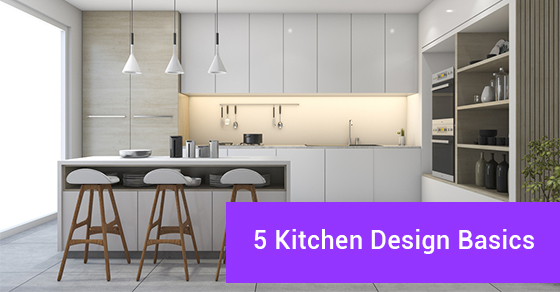 Here are some things you might want to consider when designing or renovating your kitchen space. It’s no use trying to stuff a square peg into a round hole, so to speak. Most kitchens are about 10 feet by 10 feet, but that can vary. If your kitchen is smaller, you can still do a lot in terms of design. Many stores offer “kitchen in a box” options which include cabinets and counters. Some include appliances and even the kitchen sink! Even a galley kitchen can be given a new look. U shape: The cabinets and counters make a horseshoe shape. Certain standards have to be met for kitchen flooring. It should be moisture-resistant and somewhat pliable, because you may be standing on it for extended periods. You also want it to look terrific. Tile is the prudent material for flooring. It comes in many styles and colours, and is easy to take care of. Countertops can be made of various materials as well. Laminate seems to be popular, as well as granite. Much depends upon your budget and needs. One popular choice is modular granite, which is smaller than a granite slab. It’s easier to install, and if you or your partner is somewhat handy, could be a DIY project. If you’re redesigning your kitchen, you can save some serious cash by having your cabinets refaced instead of replaced. Another idea is to give your cabinets new life by painting them with a quality melamine paint. If you have the budget for new cabinets, enlisting the help of a company that is experienced in kitchen interior design may be worth your while.